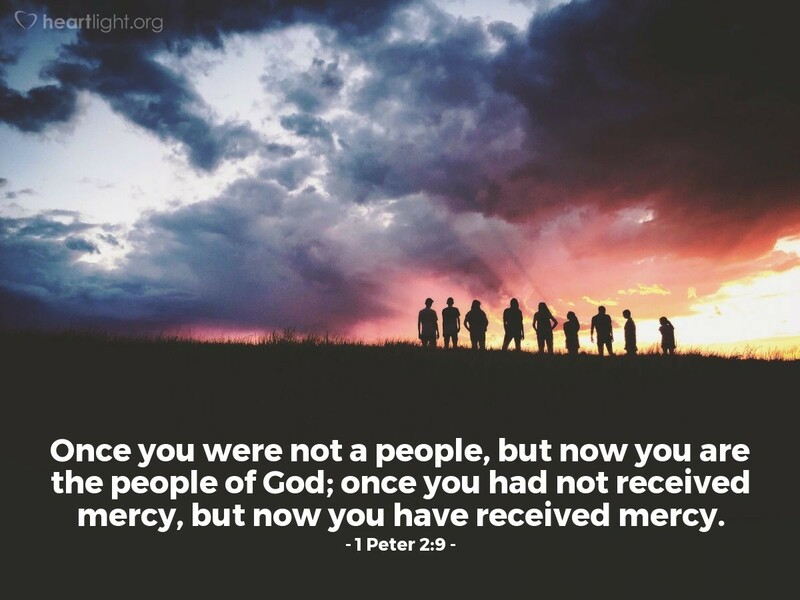 Once you were not a people, but now you are the people of God; once you had not received mercy, but now you have received mercy. Excluded. Rejected. Discarded. Abandoned. Forgotten. Pushed aside. Not picked. Each of these describes an aspect of feeling like you are a nobody. Satan gives our sinful flesh the tools and the opportunities to speak these words of self-condemnation to ourselves. But God — two of the greatest words in the Bible — loved us in Christ and brought us into his family and gave us a purpose. We are now part of the people of God! We have been chosen for the victorious team of teams. We have received mercy! Grace has washed over us and the love of God has adopted us in his family. Peter is giving maligned and persecuted people the reminder that they can choose to see themselves as "nobodies" or they can choose to see themselves by their new identity. Thankfully, Peter's words speak to our hearts, too. You, dear friend in Jesus, are God's child. You are part of his eternal and conquering people — like Moses, Esther, Paul, and Mary Magdalene. Mercy has reversed the power of sin and failure and put grace in place empowered by the Holy Spirit's presence in you. So don't live today as you once "were": live today as you are in Jesus! O Father of Mercy and God of all grace, thank you for making me new — your child, part of your people, and a purpose put in the world around me on purpose. Please help me hear your description of me and not Satan's. Please help me define my identity by your words and not my own words of self-condemnation. I thank you for who I am and that I a no longer bound by what I once was. In Jesus' name I pray. Amen.